Do you love the amazing, almost magical properties of essential oils and wonder what is the best aromatherapy diffuser like? Elegant and beautiful or efficient and silent? These nebulizing aromatherapy diffusers fill all these requirements and more! Aromatherapy is extremely powerful, the therapeutic properties of essential oils can balance your body, mind and soul. 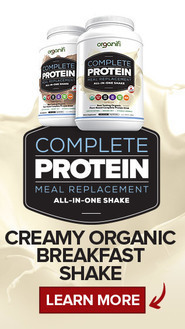 They have the power to transform your day by invigorating your senses. Do you know what is the best essential oil diffuser? Nebulizer is definitely the answer! It is quiet, efficient and maintains the highest quality of the therapeutic value of essential oils! Nebulizing diffuser uses the Bernoullis Principle, not heat or water to spread the essential oils into the air. These versatile, therapeutic and effective aromatherapy diffusers are safe, clean, use minimal amount of energy and are completely quiet. But besides efficiency, the perfect diffuser also has to be beautiful as well! Out unique collection of nebulizing aromatherapy diffuses are that for sure and form a perfect decorative, yet practical item! They have large capacity reservoirs for essential oil. Safety feature auto shut-off after 120 minutes of use. Delicate and refined, very aesthetically pleasing! It is sleek and yet substantial. This difuser is high quality hand-crafted from imported plantation hardwood. This masterpiece is paired with an hour-glass shaped glass reservoir. This versatile and functional piece is the perfect artistic complement, a true decoration piece to any environment. 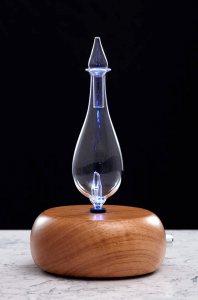 This diffuser is perhaps the most unique and substantial nebulizing essential oil diffuser. 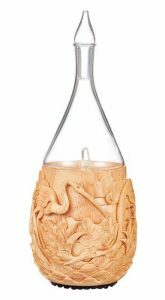 I has a large, rounded base, made from plantation hardwood and contains a strikingly beautiful glass reservoir equipped with candle-wick top. This master piece fits right in a spa, at home or beauty parlour. The raindrop design combined artistic touch of contemporary design with panache. This remarkable essential oil diffuser is stylish, delicate and remarkable, perhaps the most charming of the whole collection. The polished plantation hard-wood base together with the exquisite rounded glass reservoir with unique swirling design, form together a graceful and refined master piece. 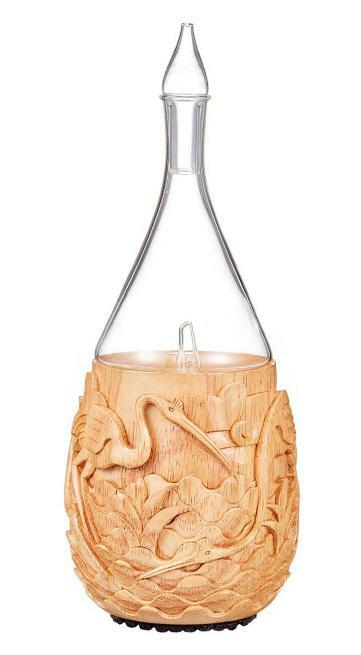 There is no substitute for the beauty and style of this hand-crafted Nebulizing Essential Oil Diffuser. Its rounded base is made from with plantation hardwood blends well into any surroundings. 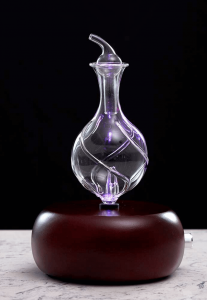 The elegant and smooth curves of the hourglass design together with bright, clear glass, turn this essential oil diffuser to one of the most popular in our collection. This essential oils diffuser is specifically developed and designed for modern and fashion-minded individuals. It appeals to people who desire something exciting, unique and fresh. Its stunning contemporary style is crafted for a sleek and polished look. A wonderful addition to any modern residence or as a discussion piece to an office! How about adding even more beauty and uniqueness for your essential oils diffuser? Still not found exactly what you are looking for? Or in search for something extra special? If you are looking for the perfect special occasion gift, you can also submit your own design, which is laser carved into the wood. These unique gifts are sure to be cherished by the lucky receiver! Can also perfect high end promotional gifts engraved with your logo. 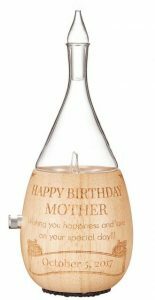 Upload any photo and message and have it accurately and beautifully laser-engraved to any of the nebulizing essential oil diffuser designs. Aromatherapy and essential oils have always been a big part of my life, smell being the most important of my senses. I hope I have answered your question about what is the best essential oil diffuser! I simply love these nebulizing diffusers because they are so elegant, silent and efficient. I have one on my desk at work and at the reception at my studio. They are a long standing favourite for gifts I give to my friends and I have gotten many customised for the special occasions. I even donated two of them for the school of my children, to be used in the classrooms for stimulating the students and helping them to concentrate. I hope you will enjoy yours and let the aromas chance your life! There are absolute stunners. Look so cool on any desk and will be a stunner for my B&B reception desk. Which voltage is it? Hi Patricia, these are real centre pieces, having one at bed and breakfast reception desk sounds really cool. Where are you placed, maybe I will come and stay a night 🙂 Both 110 and 220V. It also comes to you with UK adapter! I have never even tried aromatherapy but these devices are making me want to give it a shot and see what it is like. Even if I don’t like it I still have amazing looking centerpieces for my table! Thanks for writing this article! I can’t wait till I get mine rolling! Hi David, yes, these look truly beautiful, great handmade quality. I love the way this aromatherapy diffuser doubles as an ornate object. I really like this but worry about the usage of electricity. When I live it’s very expensive. Hi Miles, this device uses extremely low amounts of electricity. It has a cycle for 2 minutes On and 1 minute Off. It Shuts off automatically after 120 minutes. An impressive share, I was simply given this onto a colleague who was doing a little bit analysis on the topic of what is the best essential oil diffuser for his aromatherapy article in our online paper. And he in fact bought me breakfast because I discovered this article for him…smile. So let me reword that: Thnx for the treat! However yeah Thnx for spending the time to discuss this, I really feel strongly about the benefits of aromatherapy and love reading more on this topic, especially more on the different oils and blends. Also would you thoughts updating your weblog with more details about the ways that aromatherapy helps to balance the doshas? Hi Brian, happy to know you found my article about essential oil diffuser useful. I am planning to write more articles about the usage for the different essential oils and also dosha balancing within the next few weeks. Thankfulness to my father who loves aromatherapy and told me about this truly remarkable website. I love essential oils and aromatherapy, but didn’t realise they were also part of ayurveda. Very interesting! We often take old knowledge passed verbally from one generation to the next for granted! thank you for your lovely comment. Yes, essential oils are used in many ayurvedic remedies and of course skin and hair creams. 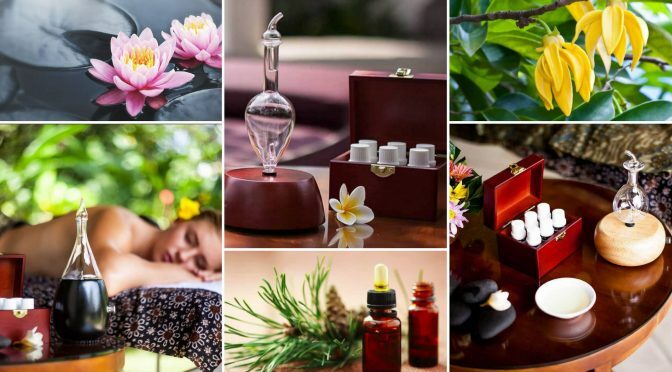 Aromatherapy has always been one of the most important ayurvedic therapies. So much knowledge from herbs and plants has gone to waste because people started to only rely on Western medicine. Luckily ayurveda is well documented and practised daily by millions. Can you use essential oils with carrier oils with this diffuser. In principle yes, but why would you? 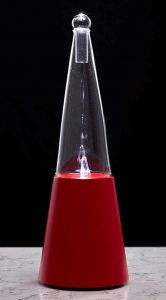 This diffuser is very efficient and for optimal results one should use pure essential oils. My sister just asked me yesterday: Do you know what is the best essential oil diffuser? Now I do! I like the fact that these diffusers keep all the aromatherapy benefits of the essential oils. I mean why to buy pure ones and then get them diluted with water or poluted by smoke? This is the reason I 100% agree with this review. thank you very much! I have been convinced that nebulizer is the best essential oil diffuser type for a while now, for the above reasons. I really enjoyed your article: what is the best essential oil diffuser. I am wondering if you can see the usefulness of water vapour diffuser for inhaling the essential oils? yes, absolutely! I use essential oils in an inhaler when the kids are sick with airways infection. I just don’ think vaporising difffuser is the best for using for general purpose as it dilutes the therapeutic qualities of the essential oils. These are beautiful. I saw it on the website that you can also submit a photo. Do you think it will work as well as the model pieces? Hi Liesbeth, yes, photo works fine! The photo will be digitally filtered for the outlines and this will be fed to the laser machine which does the carving. So what is the best essential oil diffuser of these all? I understand they all use the same nebulizer principle? All of these diffusers are nebulizer indeed. If you read my other article about the different diffusers types, you understand all the benefits compared to the other diffusers. Radiance Nebulizing Diffuser looks really nice. I work a lot these days and I really need to concentrate more. I hope the Radiance will be good for me. Do you think will it go well with tea tree? You can make your own mixtures or just use some depending your preferences. These are fantastic! Do you know if it’s possible to get an other type of hand carving made? I would love tiger or monkeys. You can make a special request on the website, it’s then up to the artists who produce these master pieces in Ubud on the island of Bali, to approve or deny your request. Hi Viveka, no it’s made off the same plantation hard wood, just painted with lack. I love this selection of essential oil blends. I ordered them few weeks ago together with a diffuser and cant get enough of the ocean breeze and use it to freshen my office. My wife loves the the fragrance of harmony during her meditations. These essential oil blends are amazin, made from purest quality of organic blends. Harmony is a wonderful fragrance for deepening meditation. My own favourite is Pacific Northwest as I love the smell of a forest, it reminds me of my childhood. These surely look amazing! Do they all come with led lights and are the leds always blue? yes, all the models come with LED lights, which are rainbow coloured for setting the mood. They also have a touch sensor for turning the LED on and off with a light touch. 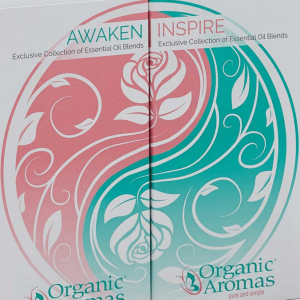 Hi, I am really drawn for the Elements Premium Essential Oil Blends Collection. Can you use these essential oil blends for massage oil? Hi Cory, these are wonderful blends indeed. You an use them for massage oil, but you need to mix them with a base oil. I would suggest to use either almond or coconut oil. 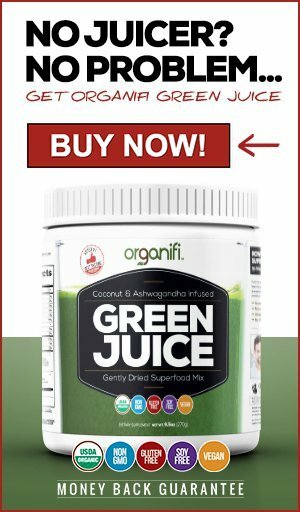 Make sure to use the ratio of 3-5 drops to 250ml depending on the intensity you desire. Anything more might cause rash or other reactions. I got one of these a year ago and was now looking for a place to order one for my sister for her new massage practise. I am thinking the customisation model with her practice logo. 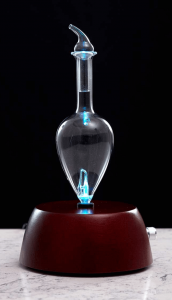 I especially love the fact that the intensity dial to allow for regulating the dispersion of oil and the soft LED light. I’m happy that you enjoy this diffuser and I know your sister is going to love the special one with her practise logo! I absolutely believe these are the best and the most beautiful nebulizing diffusers out there. I cannot imagine a more beautiful gift to give than one of these nebulizing essential oil diffusers. Quality looks amazing and I love the idea they are hand made! The option to customize it, makes it even more special! you are absolutely right about these aromatherapy diffusers making a wonderful gift. If you choose to customise it, you will for sure make it even more memorable one. I have been wondering how exactly this type of diffuser works without water and heat, now I understand. This surely is the way to keep the aromatherapy oils on their purest and maintain their healing properties. Do you know how effective this is? Hi Deidra, I am happy to know you agree with my assessment of what is the best aromatherapy diffuser! It is effective enough to fragrance a good size room.